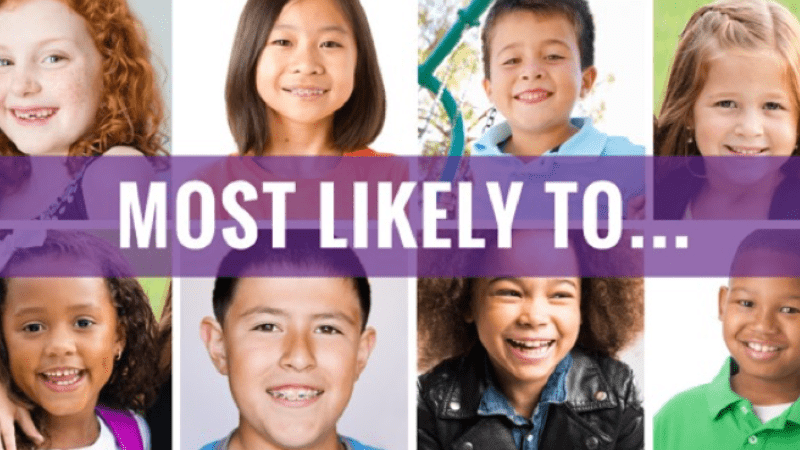 Get ideas for ways to recognize students in your classroom, school, or yearbook with titles like Most Likely to Run for Congress, Most Likely to Open an Animal Shelter, and Most Likely to Write a Best Seller. Lifetouch is the top choice for schools when it comes to professional photography and yearbooks. Learn how they can help you make your school yearbook unique this year. Forget “Best Dressed” and “Most Popular.” It’s time to give those dated yearbook titles and student recognitions a makeover. Here are 31 “Most Likely to…” suggestions that you can use in your classroom, school, or yearbook. They are fun, modern, and they represent honors that students are sure to remember for years to come. This should go to the savvy activist and peacemaker who somehow does that amazing job of encouraging change while simultaneously bringing people together. This kid is always cracking the class up with her nuanced and well-placed humor. In a crowded field of online enthusiasts, this tech savant’s young coding skills, creativity, and smarts stand out. You can’t wait to see what they invent or run in the future! This awardee is usually found behind the camera for the yearbook and school paper, so give him credit beyond the photo credit! This person loves two things without a doubt—adventure and learning about different countries. She is a bit ambitious, too, because it’s not going to be an easy feat to make it to Antarctica. It’s clear that student organizations are simply training grounds for this student’s future in leadership and public service. He probably loves election season, too. With eyes on the stars and knowledge of the planets, this student has a future rocketing the ranks at NASA. She puts in hours of practice time and takes what most people think of as a hobby to a different level. You could also feature a little write up about the student in the yearbook. Get tips for school yearbook writing here. There is often a student who is striving toward his future medical career long before he is old enough to drive. From being kind and patient to being really good in science, this M.D.-to-be has his eyes on saving lives. This award goes to the student who has talent and charisma to spare. Not only does she care about the environment, but she’s also smart, creative, and ambitious. This person is definitely going to have a positive effect on the world around her. Bestow this beloved title to the class connector—the school spirit-filled, friends-with-everyone student who brings his fellow students together with kindness and hospitality. Give this title to the student with better writing skills than most students, or to the one who most loves to write stories. Her writing work for the yearbook is amazing. She knows how to make you remember someone for years. Beyond school sports, this award recognizes the thrill-seeking student who rises to the outdoor challenges of mountains, waves, and slopes. Tutoring, peer mentoring and an openness to helping his fellow students with classwork are clues that you have a future colleague and teacher awardee on your hands. Everyone adores the class chef and resident foodie. Beyond offering to help taste test his creations, recognize his commitment to health and serving people good food. When this awardee takes the stage, everyone forgets her hoodie and ripped jeans as she transforms herself into Shakespeare’s Portia or Wilder’s Emily before our very eyes. Don’t forget to feature a fun photo. Here are tips for good yearbook photography. He has no problem taking charge, and people really value and respect his opinion. This person has a BIG future awaiting them and will do a great job of running their own company. Mathematicians do not receive enough recognition, as they quietly crunch numbers and keep their high test scores to themselves. But let’s recognize this student who excels at math because she has the potential to make all of our lives easier in some way. This all-star team player always credits his team for the wins, so why not draw him out for an individual award? The innate aesthetic of this design-oriented student is impossible to ignore. From his beautiful work in art class to his outfits bursting with individualism, this title gives snaps to the stylish. Every school has a natural emcee who is as comfortable with public speaking as he is performing or making gentle fun of himself. Present this award to that future Jimmy Fallon/Jessica Williams. This person has probably aced every science course available and can’t wait to tackle college. They have a bright future that will likely benefit millions of others. Valor and bravery are already evident in this service-oriented student who likely has military leaders in her family. Give her a taste of recognition now for her selflessness. You know that person who is friendly, flies under the radar a bit, and still has it together? He is the one that is going to open up that quaint and cozy coffee shop, which all the neighbors will adore. Social media influencers start early, using new media platforms to become better communicators and creators. Give her a schoolwide “thumbs up” rating. Take that talented art student and recognize her talents in a bigger way. And you might want to hold on to one of her current pieces. It just might be worth something one day! His world seems to revolve around music, and he might already even be in a band. Stay in touch because you’ll definitely want tickets to the show when they pass through town. She is smart, into nature, loves science, and is always asking good questions. This person knows the world is out there, ready to be explored, and that’s exactly what she will do. This social butterfly is often working too hard making sure everyone else is happy to scoop up any accolades for herself. This honor will help her shine. We hope you are inspired by these school yearbook award ideas. Get more school yearbook inspiration and resources for making your yearbook memorable at Lifetouch.com.